Let's face it. The Netherlands isn't really known for its food. In fact, it has built quite a reputation for a stodgy fare. Perhaps this is due to the abundance of heavy potato-based dishes in the Dutch diet. Vincent van Gogh may have been onto something with his portrayal of his kinsfolk as potato eaters. Or maybe visitors have had to eat their way through one too many bowls of pea soup so thick you can stand your spoon up in it (the right way to eat it, by the way). Actually, the Dutch can only blame themselves for their bland reputation. Ironic, when you consider that they ruled the spice trade for a hundred years. In fact, they were cooking some very exciting dishes until the beginning of the 19th century, when frugality became fashionable. The classic Dutch cookbook, De Verstandige Kok (The Sensible Cook), published in 1669, includes recipes for roast goose with turmeric root and queekoeckjens, candies made from quince paste. Adventurous even by today's standards. A quick visit to the Rijksmuseum will prove that there was once plenty of passion for great food in this country, and a desire to flaunt it. You only have to look at the stunning old Dutch still lifes, which were called pronk pieces (to pronk means to show off), to be convinced that the Dutch were proud of their cuisine. According to De Verstandige Kok, a festive Dutch meal in the 17th century featured plenty of wine and course upon the lavish course. The meal kicked off with leafy green salads and cold cooked vegetables dressed in olive oil, vinegar and garden herbs or edible flowers. Warm, buttery vegetables were also popular. Various fish- and meat dishes and savory pies and pastries followed. The meal ended with preserves, cheese, nuts, and sweet pastries, washed down with hippocras, a sweet spiced wine. Of course, even in the Golden Age, not everyone could afford such luxuries and the everyday meal of the ordinary Dutchman was a humble affair of grain or legume pottage served with rye bread and beer or water. But even the rich had to tighten their belts once Holland's Golden Age came to its end. After its heyday in the 17th century, the Netherlands lost many of its colonial possessions to the British in the Anglo-Dutch wars. This loss of wealth, coupled with a growing population that put pressure on natural resources, meant that a more frugal approach to food had to be taken. The most popular Dutch cookbook in the 19th century was called Aaltje, die volmaakte en zuinige keukenmeid, (Aaltje, the perfect, frugal kitchen maid). And, while this book wasn't quite as frugal as its title, it set the tone for what was to follow. You see, towards the turn of the 20th century, Dutch girls were sent to huishoudschool (a kind of domestic science school). These schools were created with the aim of teaching the poorer classes how to put together simple, cheap, nutritional meals. However, it became fashionable to send girls from all classes to these schools, where efficiency and frugality were drilled into them. Suddenly, the formerly revered herbs and spices were seen as frivolous, traditional dishes were greatly simplified and a lot of the variation in the kitchen was lost. Needless to say, a lot of passion went out of Dutch cooking at that point, and many traditional family recipes were forgotten. The legacy of this is that today, many Dutch still take a utilitarian approach to food: two slices of brown bread, a slice of cheese and a glass of buttermilk is a standard lunch, often eaten on the go, without much ritual or reverence. While it is true that meat and two veg are considered the holy trinity of their cooking, the Dutch have a rather healthy diet compared to some other Western nations. Many Dutch meals, like zuurkoolstamppot (sauerkraut and potato mash) and kapucijnerschotel (grey peas with apples and bacon) rely heavily on vegetables and legumes. Moreover, Dutch cooking is straight-forward, easy to make, cheap and nutritious. It isn't all bad, but there is certainly room to rediscover the imagination and flair that has gone missing. Luckily, the tide is finally turning. You'd have to be blind not to notice that a (slow) food revolution is slowly gaining momentum here, with (organic) farmer's markets, specialist delicatessens and fancy food shops becoming more and more commonplace (in fact, there are even edgy "underground farmer’s markets" these days). There's plenty to be proud of and to sample. In fact, the Slow Food Foundation has listed seven Dutch products in its Ark of Taste, including original Schiedam malt gin, Amsterdam osseworst, and Frisian smoked sausage. Try the local Zeeuwse mussels, which the Belgians are only too happy to claim as their own, and don't forget Holland's beloved brined herring. Yes, it's an acquired taste, but so is sushi. 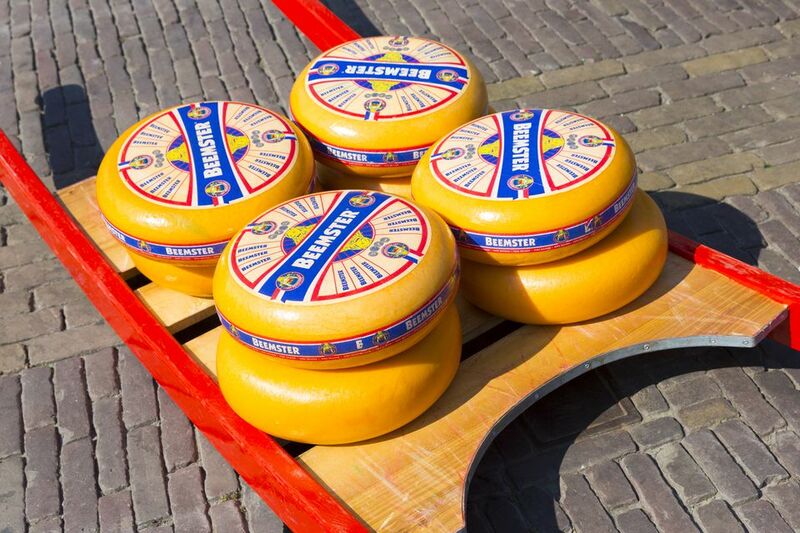 If you're a cheese lover, there's a whole universe of cheese beyond Gouda (although what the Dutch call Gouda bears little resemblance to what is sold elsewhere as rubbery plastic globes). Try a good, crumbly aged Gouda, like Reypenaer and you'll never look back. Dutch cheeses such as nagelkaas (clove cheese), boerenkaas (artisanal unpasteurized farmhouse cheese, often matured) and komijnekaas (cumin cheese) are also delicious. After long disparaging their own kitchen, the 'I love Holland' mentality is growing. Many Dutch chefs are rediscovering traditional dishes and local ingredients and giving them their own, updated twist. Holland is even hip abroad, where Dutch bars and restaurants are favorites among the fast set. In London, VOC, a stylish cocktail bar named after the Dutch East India Company, serves colonial style genever-based punches. And, in New York, restaurant Vandaag offers Dutch classics such as bitterballen and hete bliksem. The over-abundance of Dutch TV cooking shows is a clear sign that people are starting to become interested in cooking again. It only makes sense that this will lead to further exploration of the Netherlands' culinary traditions and a rediscovery of forgotten local and regional dishes and ingredients. Already, long-lost root vegetables like celeriac, black salsify, kohlrabi, and parsnips are popping up everywhere. When nouvelle cuisine and molecular gastronomy were the trend du jour, a heaping plate of stamppot may have seemed a bit boorish. But, we now live in a time when humble, honest food is once again recognized as a good thing and farmers have become food heroes. The beauty of Dutch cooking lies in its simplicity, with honest-to-goodness comfort foods like root vegetable mash and brown bean soup, and what can only be described as the best apple pie in the world. There's only one crucial thing to remember: the secret to making simple food soar is to use the best ingredients you can afford. Buy locally-grown, seasonal and organic - and let the ingredients do the talking.